All Maryland horseman breathed a sigh of relief when the tests results came back negative on January 25 for neurologic equine herpes virus (EHV-1), and the Maryland Department of Agriculture lifted the “Investigational Animal Hold Order” on Barn 7 as well as the isolated barn on the grandstand side of the Bowie Training Center. 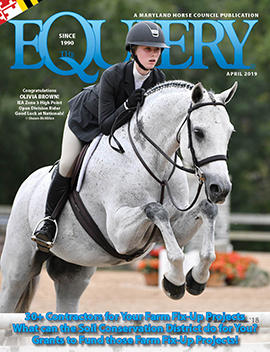 See The Equiery’s February issue for the complete story and visit our News & Resources page for the latest updates. Meanwhile, neighboring Delaware has not been quite as lucky. On January 23, the Department of Agriculture announced that a horse in the Felton/Frederica area has tested positive for EHV-1. The horse had been euthanized on January 17, at which time DDA placed the farm under a 21 day quarantine, which was lifted on February 8. During that time period, 5 additional farms were placed under quarantine pending the results from the first farm; when all results were negative, DDA released the quarantine. The Equiery can not help but notice that DDA was a full six days behind in distributing the initial alert, unlike our own Maryland Department of Agriculture, which now issues bulletins immediately, on the same day as placing the hold orders in suspected cases of EHV-1. Kudos to MDA, for setting the standard for other states!